The greatest place for LGBT people to experience all the wonderful things that come from participation in team sports. Created in 2002, the National Gay Flag Football League (NGFFL) is a 501(c)(3) sports organization that seeks to promote the positive social and athletic enjoyment of American Flag Football. Through our league, our events and most importantly our members, we also seek to foster and augment the self-respect of all lesbian, gay, bisexual and transgender persons and to promote respect and understanding from the larger community. While particular emphasis is placed on these specific goals, it is a fundamental principle of NGFFL that all activities, social and athletic, are conducted to be inclusive in nature and that no individual shall be excluded from participating on the basis of sexual orientation, gender, race, religion, nationality, ethnic origin, political beliefs, athletic ability, physical challenge, HIV status or gender identity. Currently, over 200 teams in 24 leagues across the United States and Canada are members of NGFFL. Teams representing these leagues participate in the national tournament titled Gay Bowl, hosted every Columbus Day Weekend in a different member city. We take pride in providing a well-run league at a reasonable cost and are very interested in having new players and volunteers join us. If you are interested in learning how you can join or simply to get more information, please contact our Director of Outreach & Membership Timothy Winter. On behalf of our many players, leagues and sponsors around the country, thank you for your interest. Since 2002, the NGFFL has empowered thousands of LGBTQ athletes and allies through on and off the field engagement. We're proud of our success, and we hope you will find a home in one of our premiere gay sporting leagues in a city near you. The annual Gay Bowl returned to Denver in September with the support of the Denver Broncos. 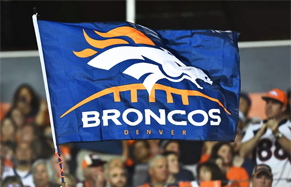 The National Gay Flag Football League told Outsports that the Broncos were supporting Gay Bowl as a local community improvement event, and that the team’s foundation was providing financial support for the event. Last year the New England Patriots contributed financially to the Gay Bowl being hosted in Boston. Team owner Robert Kraft also attended the event’s closing party and gave a brief speech thanking attendees for their contributions to advancing inclusion in sports. Gay Bowl XVIII featured 57 teams from 22 cities from Atlanta to Honolulu. Last year the New York Warriors won their fourth Gay Bowl title by beating the five-time defending champion San Diego Bolts. The Denver women's team, Mile High Club Blue, will defend their women’s title at home this year. The Broncos hosted the Oakland Raiders on Sept. 16, the last day of the tournament. “Look at a football field. It looks like a big movie screen. This is theatre. Football combines the strategy of chess. It's part ballet. It's part battleground, part playground."